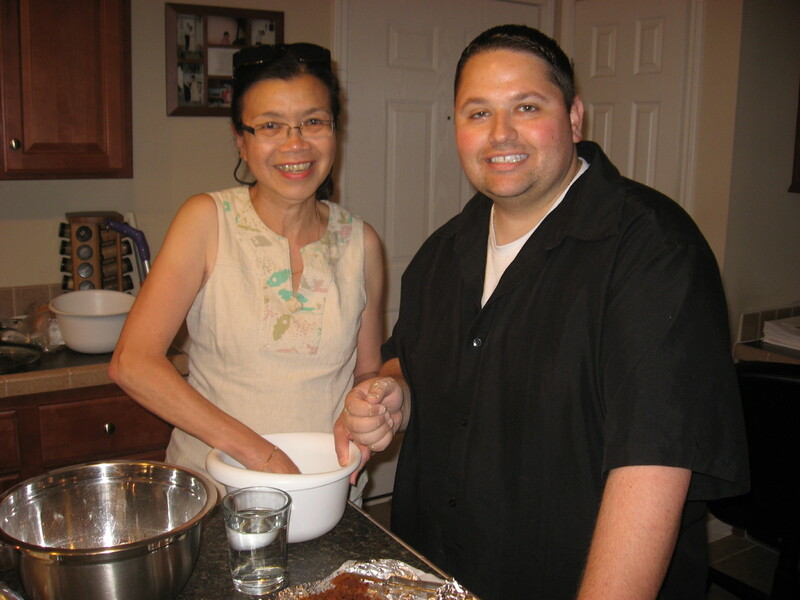 In June of 2011, Aunt Yeni and Uncle Yopi came to visit from Sydney, Australia. Aunt Yeni is an expert when it comes to baking. So we used this rare opportunity to have her teach Johnny how to make klepon, Johnny’s favorite Indonesian dessert. Making klepon is not as easy as it looks. It definitely needs a little practice. First of all, they have to “pop” in your mouth. Huh? What am I talking about? Well, let’s back up a little. The outside of the klepon is made out of glutinous rice flour. The green ones shown in this picture are pandan flavored, and the pink ones are rose flavored. 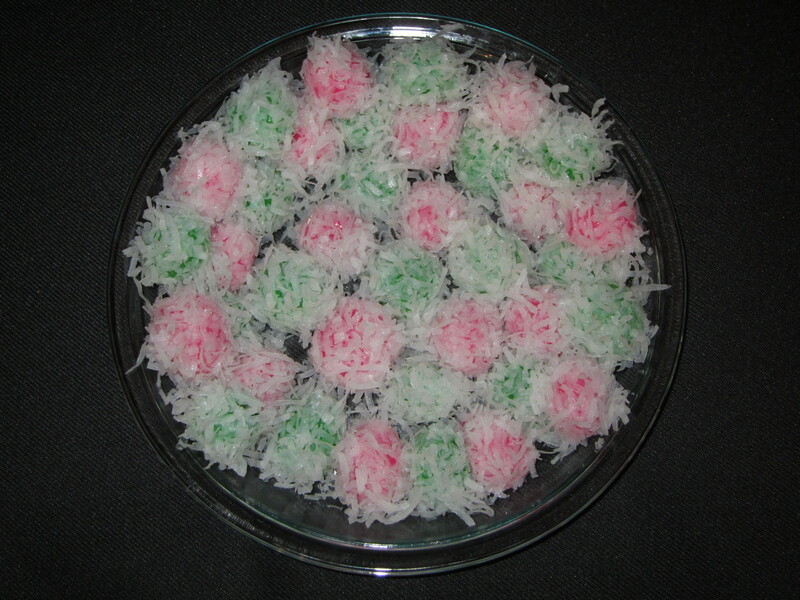 To finish it off, the klepon are coated with grated coconut. Now, here comes the fun part. Inside these little balls is palm (brown) sugar. Once boiled, the sugar stuffed inside will liquefy. Hence, when you eat a klepon, the liquid will burst in your mouth. The first time Johnny tried to make klepon on his own (after Aunt Yeni left), things did not go so well. The balls were made somewhat too large. In some of the klepon, the sugar did not quite “pop.” While with the others, the sugar oozed out of the klepon. But no worries. Johnny is quite the perfectionist when it comes to his craft. Last night, although somewhat of an impromptu, he made another attempt at making klepon. And guess what? Three times is the charm! This time all the klepon turned out perfect! So give it up to Johnny, an American guy who makes the best klepon! Shave palm sugar until you reach 1/3 cup (packed). Place the glutinous rice flour in a bowl and slowly add the warm water and pandan food coloring, mixing with your hands. The consistency should be similar to that of play-doh. Pull off about 1 teaspoon of dough and flatten into a disc. Place about 1/2 teaspoon of shaved palm sugar in the middle. Fold up the edges and seal completely. Roll into a ball about 1 inch in diameter with the palms of your hands. Heat a large pot of water until it starts to boil. Drop the balls one by one into the boiling water and wait for about 5 to 10 minutes until they float to the surface. Then let them cook for one more minute. 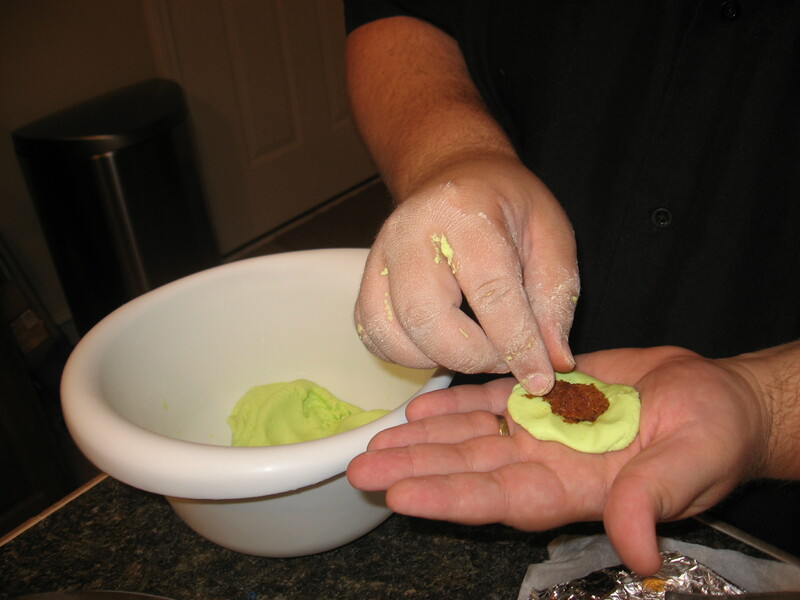 Remove the balls and drain well before rolling them in the coconut-salt mixture.